If you are Canadian, you know what a toque is. And for you a toque is an essential accessory for winter, spring and fall too. While Vancouver lacks the sub-zero temperatures of Montreal and Halifax, it is cold, dreary and damp for a significant portion of the year. Is time for this year's new toque? Why not knit this classic, quick-knitting hat to match your antler cardigan! 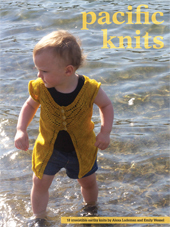 The ebook includes 18 patterns, including 5 sweater designs. Head Circumference: 16 ( 18, 21, 23)"
*Alternatively you can use the magic loop technique to knit in the round using a single long circular needle.